The Seahawks were justified in their bellyaching about officiating, but their junior varsity offense was responsible for putting Seattle in a hole requiring competent officiating. No DE Michael Bennett, no SS Kam Chancellor, no LT Bradley Sowell, no RB Thomas Rawls, and a still-limited QB Russell Wilson. So the Seahawks were surpassingly ordinary Sunday at the Superdome in New Orleans. Add in some sub-ordinary NFL officiating, and the Seahawks took a 2×4 to the head from a weak team. If field-goal holder Jon Ryan handled a snap better to get three points at the end of the first half, all the above reasons/excuses likely could have been ash-canned, because at the end of the game, the Seahawks would have needed only a field goal instead of touchdown to beat New Orleans. Instead, the Saints’ 25-20 win was a fair outcome because the Saints did more with their opportunities than did the Seahawks. The poor game by the officials (the 11-2 disparity in fouls was particularly onerous) is, as always, a factor that each team is obligated to overcome. The Seahawks will always have more overcoming to do than most teams, because they play so aggressively on defense. They had 10 last week in the 6-6 tie with Arizona. Teams have to overcome their weaknesses. The past two games, the Seahawks couldn’t. In the final two minutes, the Seahawks had their best drive, as has happened many times under Wilson, covering 57 of the needed 67 yards without benefit of timeouts. But he can’t always beat long odds. The odds were so long because in the previous 59 minutes and 58 seconds, the offense produced only 13 points (FS Earl Thomas scored a defensive TD on a fumble recovery return). The lone touchdown was set up by some walloping trickeration — a double pass in the second quarter from Wilson to WR Tanner McEvoy to RB C.J. Prosise. The rookie-to-rookie portion produced Seattle’s longest play of the day, 43 yards, which was followed by RB Christine Michael’s two-yard touchdown run — the first and only six-pointer from the offense in the past tw0 games. Other than that, it was the same two-for-three field goal production of the previous week against Arizona, only the Saints’ defense was nowhere near the caliber of the Cardinals’ defense. Yet the Seahawks managed three yards rushing by halftime. That’s like the Beatles singing the first phrase of “Hey Jude,” then quitting for lunch. 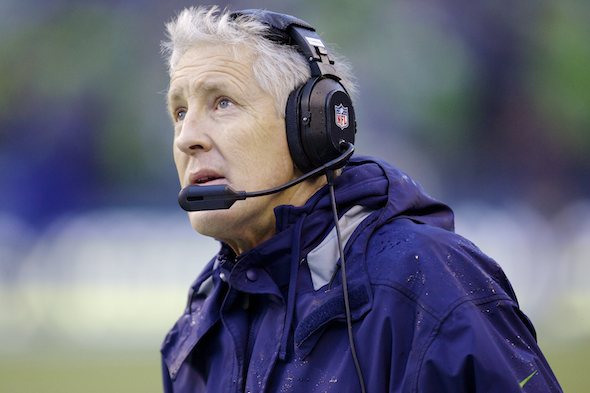 Coach Pete Carroll always says you can’t win the game in the first, second or third quarters. It’s just as true that you can lose the game before the fourth quarter, especially when the first half has only 19 offensive plays. With so many youngsters in the offense — George Fant did indeed start at left tackle, and played as you might have expected for someone fresh off the basketball court — the Seahawks are a junior varsity version of themselves. Wilson knows that better than anyone. Rhythm is Wilson’s buzzword stringing together positive plays for a first down for four or five times in a row. The inability to do so is largely a function of the worst offensive line in football no longer being bailed out by the unusual talents of RB Marshawn Lynch, or Rawls, or a healthy Wilson. Wilson played the full game Sunday. His ankles were no longer covered in tape that looked like spats. He reportedly was wearing a smaller knee brace. And, incredibly, he threw 34 times with a sore pectoral muscle. So he again gets another participation ribbon and attaboys from all. He completed 22 passes for 234 yards and one killer interception. But his longest pass play was for 27 yards, and that was a catch and run by WR Doug Baldwin on the final drive. Wilson ran three times for 11 yards, which is 13 more than last week. He insisted he was good to go, although is QB rating was a season-low 74.8. “I felt great today,” he said. “I finally felt like I was really moving a little bit there. Didn’t have too many huge opportunities to run and move. Meanwhile, all this forward-looking has left behind a draw and a loss, plus a defense that was left out on the field too long for the second week in a row. The Saints held the ball for almost 37 minutes. But by the end, they were again on fumes.They allowed Saints QB Drew Brees, who remains brilliant at 37, to take a leisurely, 52-yard stroll with their final possession –11 plays over 4:41 — to get a field goal at 1:57 that forced the Seahawks, out of timeouts, to pursue a touchdown to win instead of a field goal. Carroll was forced to burn a timeout on the Saints’ final drive when the clock kept running despite SS Kelcie McCray completing a sideline tackle by downing RB Tim Hightower out of bounds. Carroll said he couldn’t see the play well enough to know whether his team was hosed again. They were. But he was already torqued with two Saints pass plays in which CB Jeremy Lane was picked, including one that went for a touchdown. So were the Seahawks, by a 2-4 team with a bad defense. In the NFL, there’s no recourse for bad officiating. Or rushing for three yards in a half. Carroll confirmed that Bennett, hurt two weeks ago against Atlanta, will have arthroscopic surgery, the least invasive kind, on the knee that kept him home Sunday. He estimated a sit-out of two to three weeks. The only other injury of significance was a ankle sprained late in the game requiring DT Tony McDaniel to be carted off to the locker room. I’m really burned out watching no O for 3 quarters then in the 4th watching the O suddenly wake up and do well. Why can’t they play ALL 4 quarters like their hair’s on fire, not just the 4th? And it’s not just due to a soft, prevent D in the 4th. Magic Johnson was once asked why the Lakers would finish the first half with such big leads and he replied he wants to put away the other team as early as possible. As you wrote, with 1:50 left they go right down the field – if not for the awful, fumbled field goal hold in the first half, we would have been able to win the game at the end with a FG. But WTH went on the other 3 quarters? Granted, the O line is crappy, RW has bad wheels and Rawls is out, yet the Saints (Aints) are a gimme. If this game results in teh Hawks losing home field advantage, they only have themselves to blame. Graham’s $9 mil sure would have looked good on the O line! Our non-productive offense, with their piss-poor execution, puts as much pressure on our defense as many opposing offenses do. Offensive, indeed. Of course, same was said a year ago and it was fixed. Periodically, our offense looks inspiring. Like last year’s run against less than top tier opposition. Rather like today’s, for that matter. Except today, we didn’t prevail. Do really, consistently good teams always need to find a way to win on the last drive or play of the game the way the Seahawks do? I get it! – it keeps butts in seats and sells advertising! Brilliant! The Seahawks must be the darlings of Madison Avenue. If Carroll could 16-0 with 16 blowouts, he would do so. The NFL has been legislating parity for 50 years, and has largely achieved it. The Pats, Packers, and Panthers have `won titles while winning many games late. Look around, not just at the Seahawks. Ahhhhh……… never mind %$&#*! @ O line!!!!!!!!!!!!!! I wondered how that was spelled. Erm Pete, but that’s exactly what you’re doing with Russ. Hello! No part of Hightower’s body was downed inside the field of play, result, the clock stops. On the part of the refs it was either a dumb call, or crooked one. We may be loaded with talent, but unless we’re going to play for the entire 60 minutes we’re going to burn. At least the defence is keeping things close . . . . for now. The sixty minute critique is misplaced. No issue with effort. Question O-line talent? Sure. Refs? Sure. You commented on Fant above; I thought that after the two early penalties, he played pretty well. He definitely was better than I expected him to be. Cable will turn him into a good player, I think. “that’s exactly what you’re doing with Russ” – Russ signed the big contract. Bennett and Cam have yet to be offered that. Healing is all important for those two. What if they were reasons? I thought the snap that Ryan couldn’t grab was a poor snap. If so, it wasn’t Ryan’s fault. I seem to recall that a bad snap on a FG attempt happened in a previous game (Rams? ), causing Hauschka to miss a FG. I can see excusing a bad snap once, but not twice. And if it was in fact a bad snap, nothing personal against Frese, but I think it’s time to release him and bring back Clint Gresham, presuming he’s still available. I don’t think his salary was that high. You made a good point last year that during the last six games or so when the offense was so hot they basically switched to using a lot of timing patterns on pass plays. That does not seem to be clicking this year since Wilson has no confidence in the line. Even on plays he should be stepping up into the pocket, he runs outside he is so sure another pancake tackle is headed his way. Baldwin is the most natural player for timing patterns. Jimmy Graham not so much since he gets held up as a tight end. It looks like the offensive line is from the dollar store and the running backs are from a homeless camp. I think Wilson moved into the rush Sunday more than I’ve seen him do before. Don’t know all the reasons, but insecurity about protection is valid, especially after three injuries during sacks. The line will get better, as it did last season. The question is whether it will be done fast enough. Is it OK for me to complain about Bevell again yet? No mater the state of the O-Line, no matter who the RBs are, ever since he arrived, I do not get this man. I’ve never gotten him. I thought we won the first SB in spite of him and I hoped so hard that he would get a HC gig after that game. Then he singlehandedly lost the 2nd SB of the Carroll era, as we all know. I will go out on a limb and say I think we would have 3 SB *victories* with someone else running this exact offense with this exact talent. I have never understood what they are trying to do on offense. He was lucky as hell to have Marshawn for a few years, to cover up for his complete lack of coherent football philosophy. Watching an offense that relies on magic and trickeration drives me freakin’ mad. I’ve said “I can’t take it any more” sooooo many times about Bevell…. I don’t think I can take it any more!!! Well, you better figure out how to take it. His track record and Carroll’s belief show no evidence of incompetence. Fans who lament OC playcalling usually have no idea the condition and relative strengths/weaknesses of linemen/playmakers at a given moment, which often dictate calls — especially when matched against the opponents’ strength/weaknesses. Do you think Bevell has the same set of plays available to him when Wilson can’t run, the left tackle is in his first pro start, and Lockett can’t move to get open? And when the defense knows all of that as well? Love the Hey Jude metaphor. Regardless of everything going on with limited offense, injuries, officiating, etc. the Hawks are still sitting pretty for the division crown. That tie was a killer for Arizona because it means that if they lose the game at Seattle and the Hawks win when Arizona has a bye then the Hawks will technically own a 4 game advantage due to owning the tiebreak. However, the news is nowhere near as rosy for the prospects of finishing in the conference’s top two and getting that home field break. 11-4-1 looks like a best case scenario for Seattle (7-2 to close it out) and both Minnesota and Dallas look like they may get to 12-4. Still a little early to project and Minnesota’s offense is unproven but just sayin’….other than beating a badly injured RG 3 in the post season and relying on a Minnesota kicker missing a 10 yard field goal, the Hawks have won about once in 30 years on the road in January. Playoff road wins are exceedingly difficult. Which is why scuffing one to a mediocre team gets to be painful come playoff time. But every good team does it once or twice a year. There were indeed a handful of bad non-calls and that headscratcher of a defensive holding call, but a good chunk of the Seahawk penalties were pretty legit looking offensive holding calls. Also, the zebras did not make Wilson roll out straight into a blitzing linebacker to kill a drive. Hard to blame him too much for not trusting his pocket enough to step forward on that play, though. No offense is going to make hay facing 3rd and 20 every other series of downs. A decent second half made the time of possession look more respectable than it actually was, the defense was out on the field almost the entire first half, and you could tell they were already tired before halftime. Man, I miss Big Walt. It was clear that Wilson was not up to passing accurately. We have a very good backup. They better start using him. You, sir, are a true Seahawks fan. These starry-eyed newcomer “12s” folks would never start chanting for the unproven backup QB ten minutes before halftime the way us oldsters do. KEL-LY STOUF-FER! KEL-LY STOUF-FER!…. You had to put it in CAPS, the most maddening Seahawk ever . . .
Good take, Art, the O looks relatively feeble. But I can’t get past total disgust with the officiating. It wasn’t just a number of just bad calls – at least four that I counted and three killed promising drives – it was non-calls such as you noted with the McCray tackle that was obviously out of bounds and the flagrant pick on Lane. I believe with even officiating the Hawks would have won anyway. The zebras are well trained, well paid now and really have no excuse for the crap we watched Sunday. I’ve observed Houchuli ref enough games to think of him as among the trustworthy – not anymore. I’m once again convinced that eastern teams are somehow spotted an edge on their home turf when playing western teams, especially, it seems, the Seahawks . . .
Not buying any of the bias conspiracy, John. If it were true, how do you explain Sherman’s final play in the Atlanta game when his “assault” on Julio Jones went unpunished? That was one play, Art, and view of the move was partially blocked by Thomas. Sherman’s move was relatively subtle, what happened in NO was not . . .
Wonder how much longer the defensive side of the locker room is going to remain quiet and supportive about their offensive counterparts? Perhaps if they forget last season’s second half. Just as confounding as the officiating was (is) Seattle’s utter lack of commitment to the run game. This should have been an opportunity for the big guys up front to put their heads down and brawl, putting less pressure on an injured Wilson while consuming clock time – keeping Brees off the field and giving the defense some much needed rest. It would’ve been just the medicine the the team needed. The Saints, of course, game planned against it, and early penalties put the Hawks in poor positions to run in the first half. However, Seattle came out in the second half and was having legitimate success. Then, they just seemed to abandon it. Perhaps they’re trying to establish a new identity. But “Banged up hero QB” is not a very imposing one. I suspect you’ll see a commitment to the run Monday, and if it succeeds, you deserve full credit. Be prepared, however, to reap the whirlwind if you have screwed up.